(TibetanReview.net, Nov30, 2017) – A Tibetan fighter has won the Swiss Championship of a world kickboxing tournament held in Zurich recently, reported the Tibetan Service of Radio Free Asia, Washington. The report said the Tibetan fighter, who goes by the name of ‘Yeshi Tibet’, knocked out his opponent, who was named as Timo Durst, within minutes of the start of the fight in the final match on Nov 18. 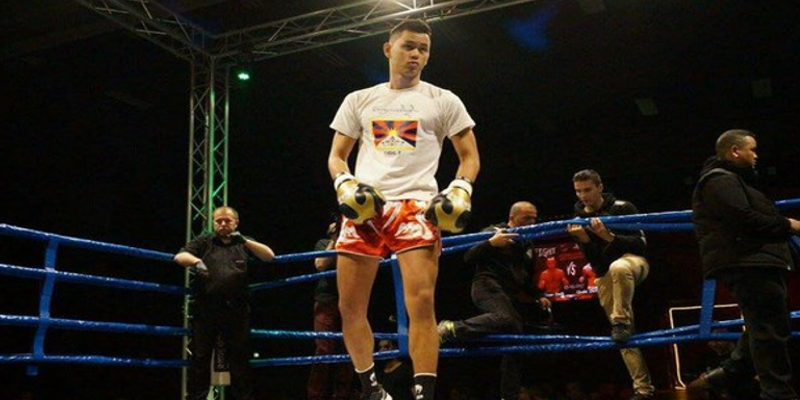 Yeshi Shitsetsang, a 23-year-old Swiss-born, makes clear his Tibetanness by wearing a T-shirt printed in the front with a Tibetan flag and a caption above it in Tibetan which means ‘Unity of the Three Provinces of Tibet’. The tournament was organized by the WKU-Swiss and held at the Sporthalle Gries in Zurich. WKU (World Kickboxing & Karate Union) is a global federation of kickboxing and karate sports. WKU-Swiss is a union of Kickboxing, Thai boxing and Karate clubs.